Do you believe in reduce, reuse & recycle ? I do. I hold on to lot of (recycling) stuff on the name of craft but I've been doing some cleaning as I don't have enough space & time at this moment to put all the recycling stuff to good use. So, while doing one of such cleaning other day, I found this plastic hanger with hook(top part) broken, I was not sure if I can recycle it or I have to trash it. 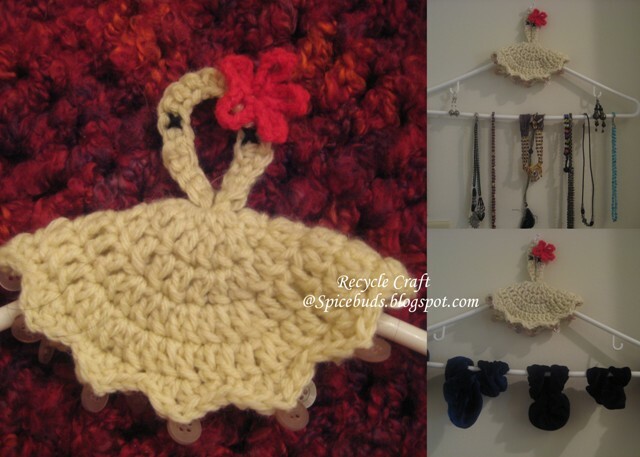 Little yarn from my stash & some time and this hanger got a new look & on the plus side lot of my cloth rubberbands(which were also given new life by just changing the elastic from them ) also got a new place to stay on. But now I'm thinking, using this new Ms. hanger as my necklace holder wouldn't be bad idea too. That way there are more chances that I'll wear them & not only keep them. Picture is not good at all. As I was being lazy to take it off from the wall & to well lighted place for click, but still wanted to share the idea with U guys. For recipe you can click here. I might update this post whenever I make another batch, as mine were good taste wise but some of them had large sugar crystals. So whenever I get my hands on some Organic oranges I'm gonna give them another try. But let me clear one thing no matter how they looked, they were delicious....sweetly & citrusoly (i know it's not even a word but I hope U understand the word flavor I'm trying to say).DO NOT try to skip the blanch step, I reduced it by 10 minutes in total & could taste a little bitterness at the end while eating nothing to hold U back but I believe at least 30 minute of blanching would have been better. Time worth spent. I googled for the same recipe & here's another one I like. 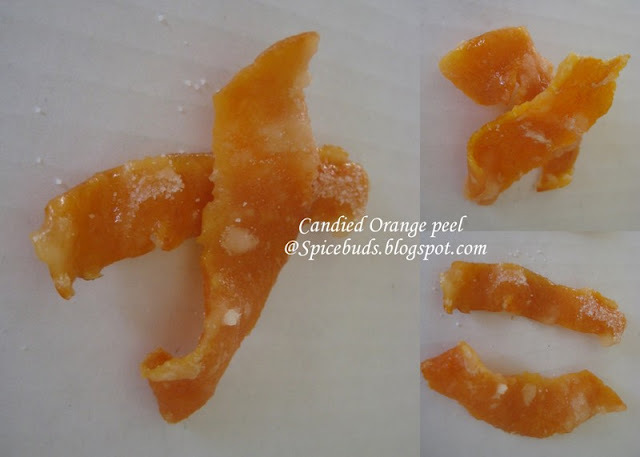 So, go find some organic oranges, not that U can't use regular ones but organic will be better option, make some of this candied peel & enjoy it. You read it right Valentine's Day Pancake. Valentine's Day is all about your loved ones. 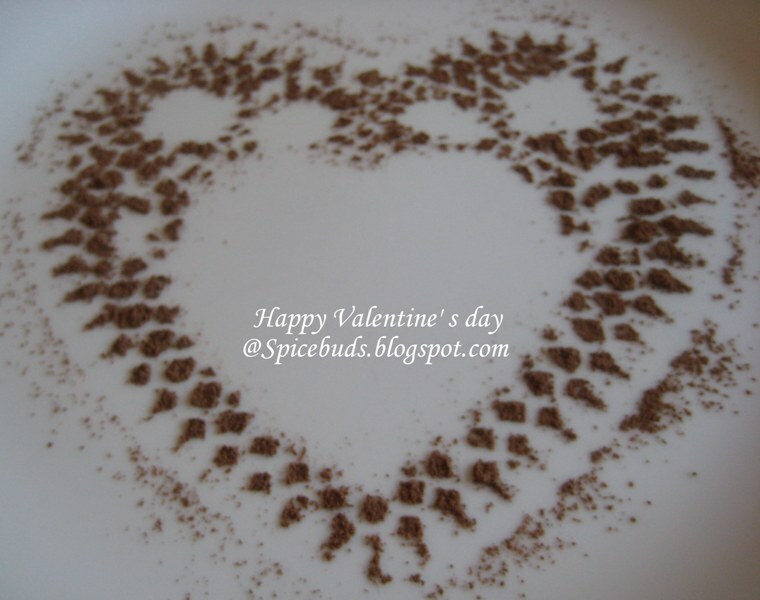 And on a food blog what can be better than heart healthy food to show your loved ones that U not only love them but care for their heart too. Back in DEC. 2009 I posted egg less pancake in this blog & that is fourth most popular post on this blog. That time I use to use store bought Pancake Mix & fortify it with some healthy stuff from my kitchen, but that was the last box of store bought pancake mix I bought. No, my kids didn't stopped eating pancakes it's just that I started making my own mix. I started with all purpose flour based & now from almost last one year we are having totally whole grain pancakes with few other good stuff thrown in and these are egg less too. And no more non-stick pans too. I do not always use buttermilk, most of the time I use home made curd/dahi/yogurt as that is always available in my fridge. I thin it out with some water to get the consistency of buttermilk. If using flax meal & wheat germ, I always add them to the ready batter at the last moment only as I notice if I add them before the batter resting period, it makes the batter little starchy/gooey. I tried to use it as egg substitute here in this recipe but outcome wasn't welcomed by my kids. To make these pancakes egg less I use combination of buttermilk & baking soda. Though I'm using flax meal also which is a good egg substitute but I'm not using it as egg replacer instead just to add some more nutrients. Wash, hull, dry & slice the strawberries. Put them in a bowl & sprinkle 1/2 tbsp. of sugar on them,U can use more if berries are more on tart side or if U like more sweet. Gently toss them. Keep aside. This simple step of macerating strawberries really bring out the flavours and add a special touch to otherwise routine breakfast of pancakes. U can also use other flavours like orange juice or balsamic vinegar to macerate the strawberries. 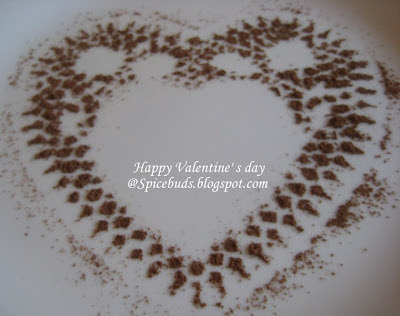 In a big bowl, mix cinnamon powder & all the three flours we r using for pancake. I like to use whisk here. Add liquids(buttermilk & water) to the flour mixture & whisk them together. Let it sit for 5-10 minutes. When ready to cook heat a cast iron skillet on no more then medium heat. Add baking soda & if using optional items( wheat germ & flax meal) add them. Gently mix adjust the consistency of the batter. In case if u r using flax meal & wheat germ chances are U will need little extra liquid. Put few drops of oil on the skillet & pour a ladle full of batter, using the backside of ladle gently swirl it around in round shape. Cook on med. heat. When turns little brown on the bottom side flip the side & let it cook on the other side around 40-50 sec. on each side. Do not press on the pancake with spatula while they r cooking on the other side. 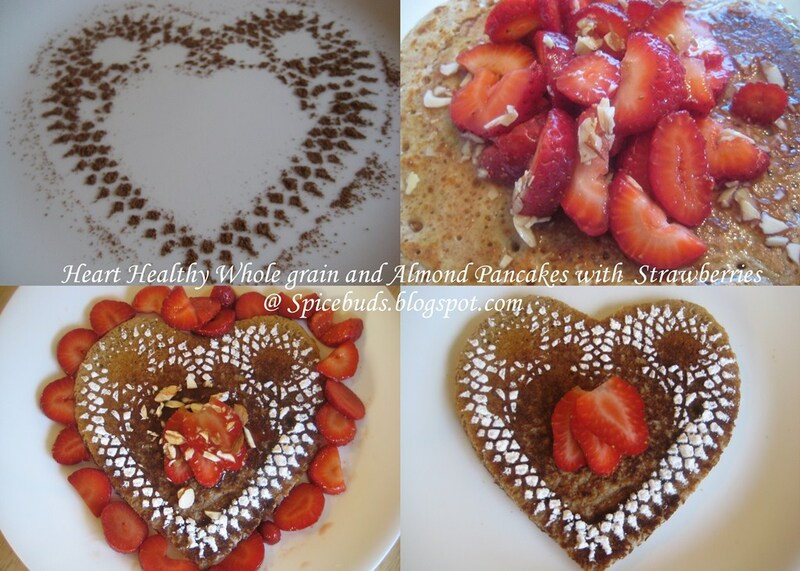 To serve put some strawberries with their juice on top of the pancake, top it with maple syrup or honey and finally sprinkle some slivered almonds. Please, do not spoil all your efforts for making it so healthy by using store bought pancake syrups, they are full of high fructose corn syrup. If U like the syrup make your own. Mix together 1 part honey with 2 part water & boil it, turn the heat to slow & let it reduce little bit. Serve it when it's cool. If planning to serve with Syrup make sure U make it before hand so that when U are ready to dig into your warm pancakes, syrup is also ready for U. Note : these are not very fluffy kind but still very good and melt in the mouth kind pancakes and no need to mention totally Heart Healthy. As per my experience if I'm planning to make regular fluffy kind pancakes I usually replace half of whole wheat flour & oat meal with all purpose flour & also add a tiny pinch of baking soda in addition to the regular amount I'm using. These pancakes are not only perfect for breakfast but occassionaly my kids love to have them for dinner too, with a cup of warm milk. 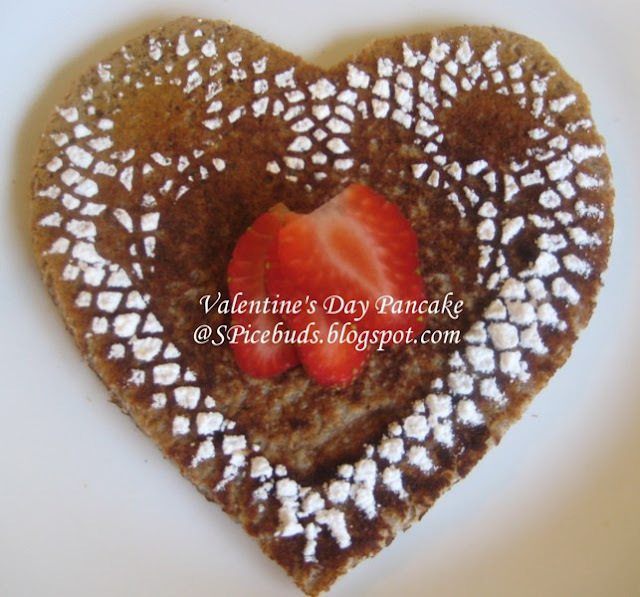 To surprise your kids this valentine's day U can also pack them for lunch, just use medium size heart shape cookie cutter to cut a big pancake into bite size hearts. Pack some honey in a small container & some macerated strawberries in another. Don't forget to pack a fork to eat them with. And a special note to tell them how much U love them, not only today but always & O'course don't forget to mention the magic words for the day "Happy Valentine's Day".Hope U all have nice one. No recipes only the clicks & a little description. It's an egg less vanilla cake with whip cream & chocolate chip filling and most amazing frosting. I had few different icing/frosting/ganache in the fridge from last few baking projects. So I kinda mixed buttercream icing, chocolate glaze and some home made caramel sauce and believe me the taste is so awesome. Happy watching & snacking everyone.